Foyer Refresh - Lovely Etc. Not that long ago our foyer was the ugliest room in our house. And it was definitely the most boring! Our foyer gets very little natural light, had a dated brass light fixture, and the floor was covered in horrible stained black stone. On top of that, it is pretty narrow which makes finding the right furniture and décor a major challenge. Over the past year, this little room has undergone a major transformation. I repurposed the dated brass light fixture into a modern orb chandelier (for only $20! 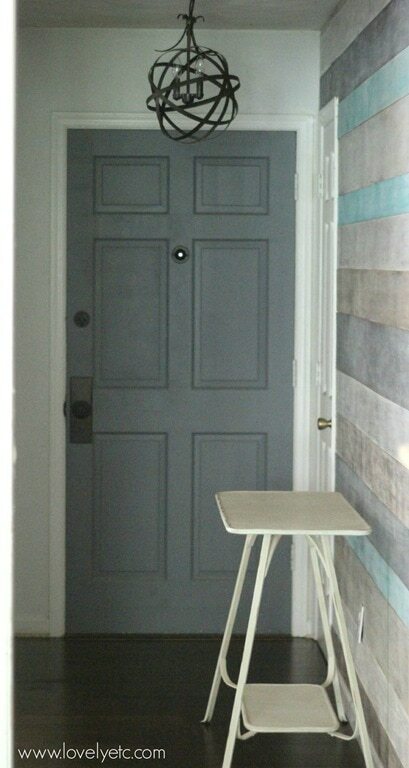 ), painted the front door gray, replaced the brass doorknobs, installed a colorful plank wall, and most recently replaced those stained stone floors with beautiful hardwoods. Things were definitely looking better. I mean, seriously, that wall is gorgeous! Even so, it still wasn’t quite the welcoming foyer I was looking for. There was something missing. I knew I needed to find some sort of art or mirror to hang on the plank wall to round things out, but I hadn’t found quite the right thing yet. Sometimes a room refresh is the result of months and months of meticulous planning. And sometimes a simple afternoon shopping trip turns into a total room redo! The other day I was shopping at Big Lots when something grabbed my attention. How beautiful is that white table! It was calling out to me from across the store. When I got closer, I saw that it is actually a cute little writing desk. I could definitely picture myself writing up my blog posts there, but I had an even better idea. This cute desk was going to become my new foyer table. After nabbing my table, I decided to take a look at the mirrors as well. I had been on the lookout for the perfect mirror to provide a focal point and break up all the horizontal lines of the plank wall. Lucky for me they had a quatrefoil beauty that was both the right size and the right price. Styles and assortment vary by store, so check back often, and check every store in your area! The Big Lots employees helped me load up my purchases, and with that one shopping trip, the foyer was redecorated! I put the table together that night and then the next day I hung the mirror. Of course I didn’t want to damage my beautiful wall, but all it took was one little nail hammered in the crack between two planks. I added a few of my thrifted treasures – a vintage balance, some antique books, some candle holders, and a few pumpkins painted with chalk paint and now it’s all ready for fall! And now I get to be greeted by this gorgeous view whenever I walk in the front door and I’m loving it. This was definitely the fastest, easiest room refresh I have done in a long time! 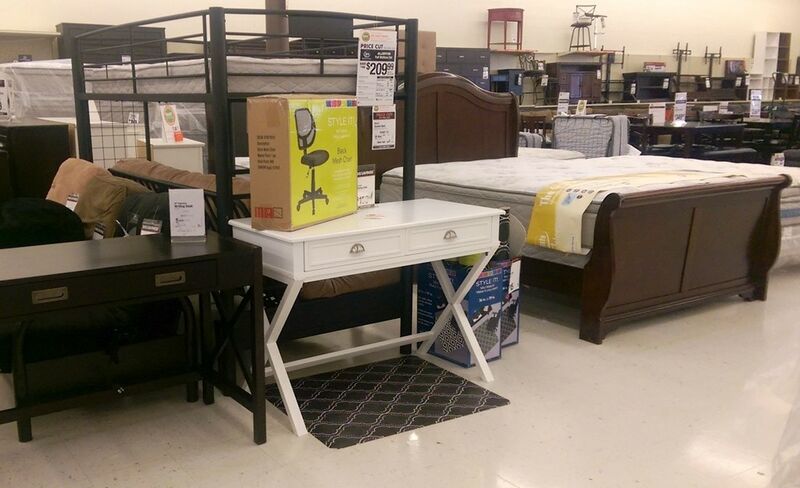 Next time you want to refresh a room in your house, make sure you check Big Lots first! Did you know Big Lots is on social media? You can follow along on Facebook, Pinterest, and Instagram for lots more affordable decorating ideas. It looks great Carrie! What a transformation from the beginning to end! I love the whole look! Thanks Debi! It was definitely a major transformation! 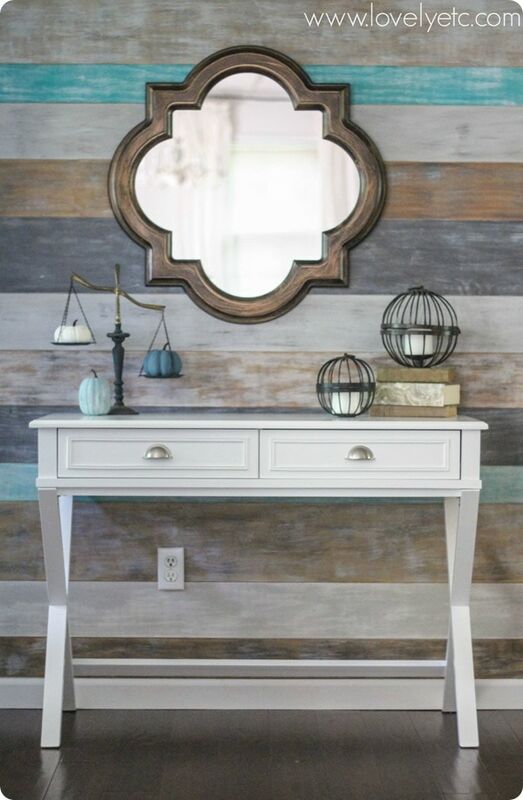 My husband and I love this wall-especially the colors you chose! My question is: did you dry rush even the base paints or did you fully paint the base oats and then only dry brush the lighter colors on top? Also, for the golden oak stain did what type of stain was it…gel, liquid, cream? Thank you in advance for your reply and thank you for doing a BOLD plank wall instead of playing it safe. We LOVE it! Thanks Angel! I fully painted the base coats of paint – but only one coat so the coverage wasn’t as even as it would normally be. Then I dry brushed over top. The golden oak stain was regular Minwax liquid stain. Hope that helps! Thanks Shelly! It definitely brightens things up. And I am an oil rubbed bronze convert. A few years ago I didn’t get why everyone loved it, but after giving it a try I get it. It just goes with any look! I love that mirror! So pretty against the stripes! Your room is stunning! 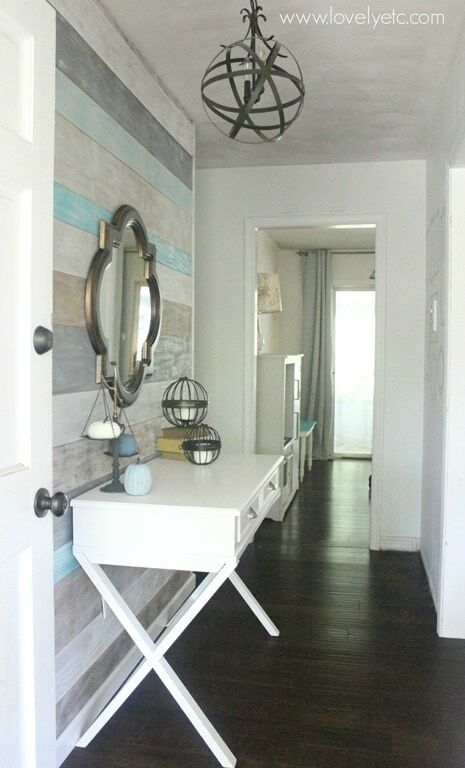 I especially love your plank wall, great job!! Oh wow! What a great improvement. Looks awesome. That wall is everything!! I might be drooling a little bit. 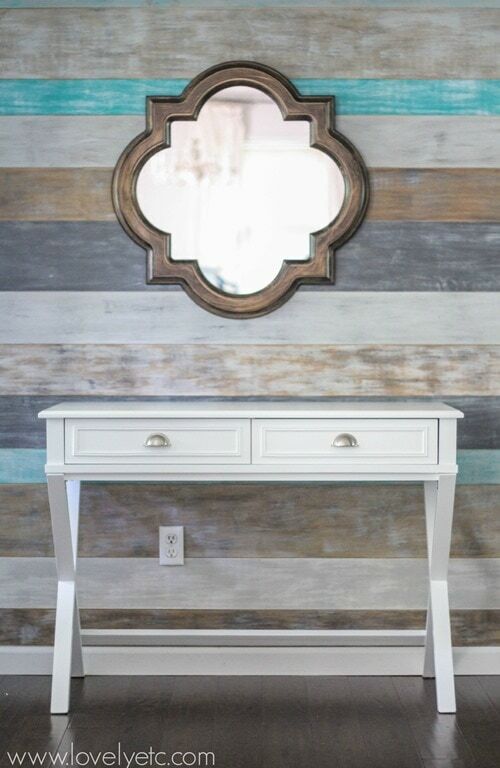 :) Also, I love that entrance table – it looks perfect. Thanks Jenn! The table really was the perfect fit. Thanks Dana! Those little pumpkins are just the right touch of fall for me. That looks great. We have been looking for a small table for our entrance and that one looks like it would be great in our house. Thanks Victor – it is such a great table. That is such a great area, so inviting! So pretty! I can’t wait until we move and have a foyer to decorate. It is so nice to have a foyer! Our previous house opened right into the living room and there wasn’t even a coat closet. This is so much easier! Beautiful ideas loving the color selections all looks very nice. Great job! Seriously – that wall IS gorgeous! That light fixture is stunning too and who knew Big Lots had so much style?! I know! Big Lots has really upped their game. I love that table you bought! It looks perfect there and you decorated it so nicely! Wow! The foyer really ‘pops’ with that table anchoring it all. And, I love the mirror, too. 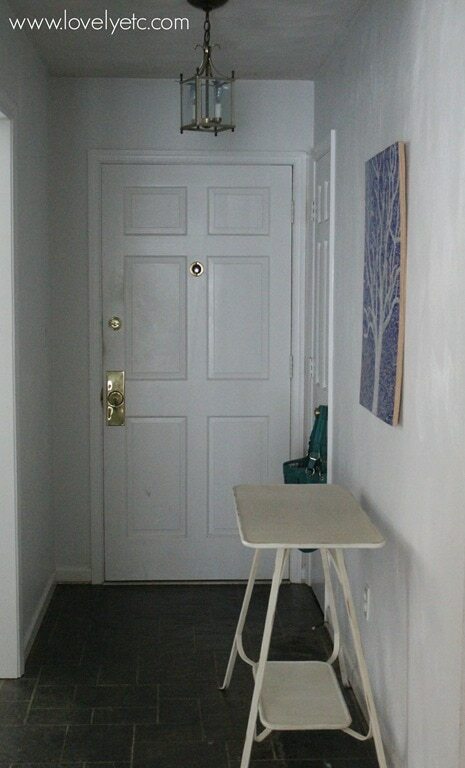 We have a very small entry space in our home and a bench with storage underneath is exactly what fit the bill for people to take off or put on their shoes. Your notes cleared my mind about a lot of mistakes that I was trying to accomplish. So glad it helped Samantha! How did you make the wall?? You can find the tutorial for the wall here – https://www.lovelyetc.com/2014/02/bold-diy-plank-wall/ It is definitely the best wall in our house!